9 Frog Images and Clip Art! 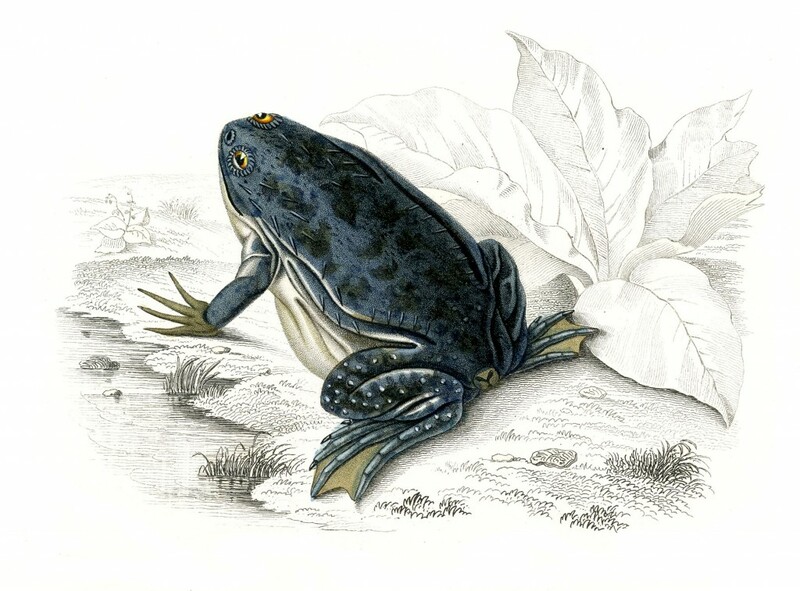 Today we have a fascinating collection of 9 Frog Images – FREE! Below you will find some fun, whimsical, and beautifully drawn frogs. We have special Spencerian Illustration frog images that are just adorable. 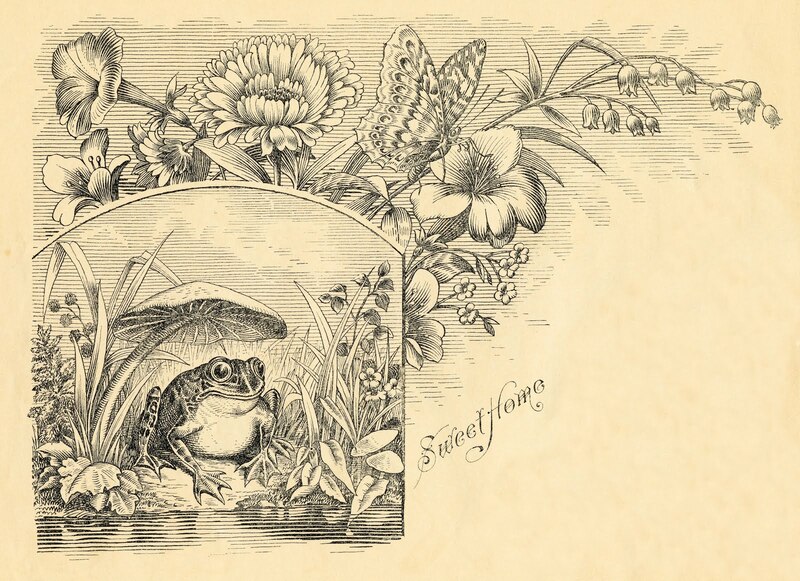 There is also a cute frog on a vintage advertising card. The images are perfect for your Animal Themed Projects or Garden Style Craft Projects! 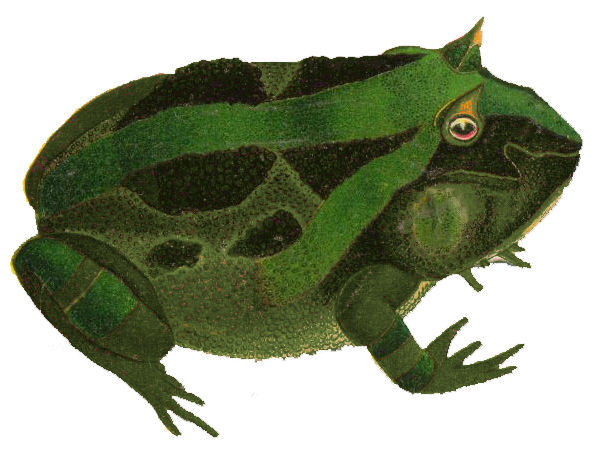 Above is a Green Frog with Black Markings. It must be a horned frog as he has obviously has a pointy horn on his head. 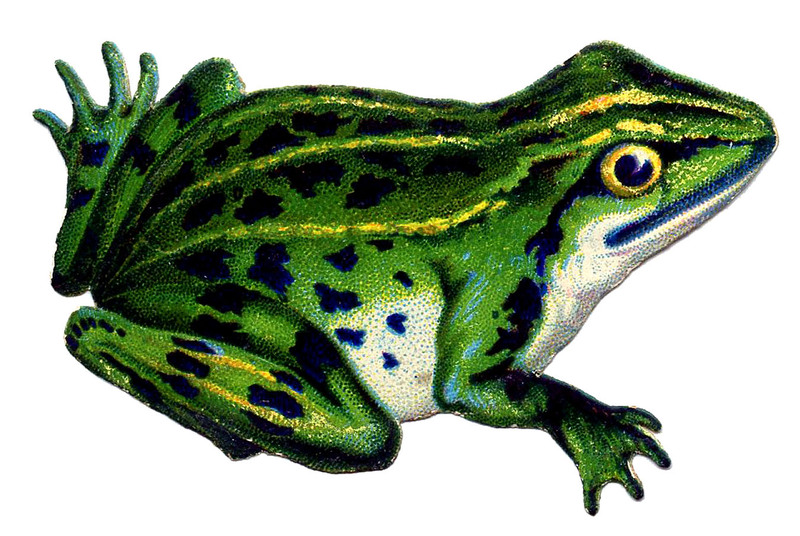 There are several shades of green in this frog drawing. I think the eye with its orange shading is mesmerizing. This is an old Scrap piece. Here we have a fun Spring Image! This one is a cute Vintage Frog! He’s nice and Green and has lovely black spots and yellow stripes. This is an old Die Cut Scrap piece. Here is an amazing Antique Frog Image! Isn’t he a beauty?! Shown above is lovely old illustration of a Greenish Blue spotted Frog. I love the white spots on his legs. The grayscale background has lovely foliage. This one was scanned from an 1849 French Natural History Print. Now this one is actually a Toad, not a Frog, but I have added him to this collection as he is similar. This is a Natural History Image. Isn’t she odd?! 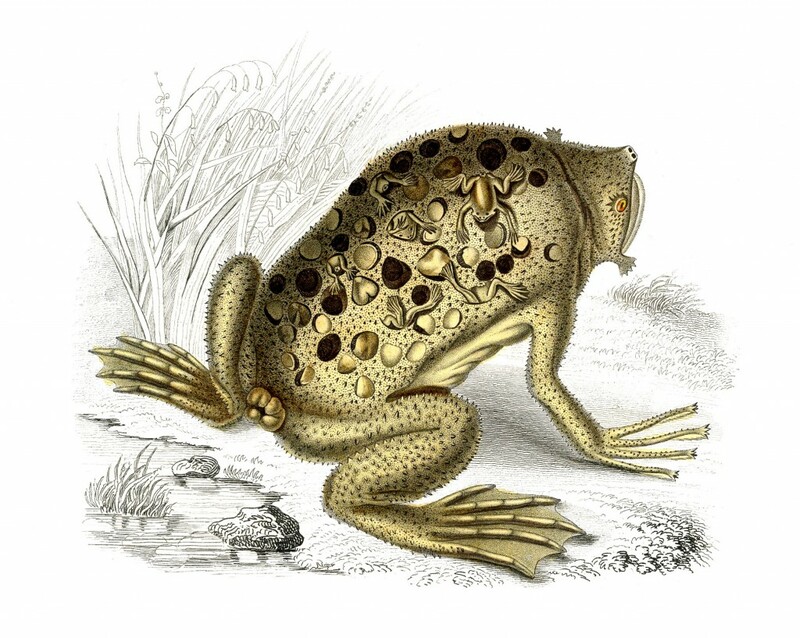 Shown above is an old illustration of a Yellow Toad; if you look closely you can see that she has holes on her back, and her babies are inside! So unusual! This Spencerian Frog is a gorgeous image from an early calligraphy book. The intricate detail of this sketch is truly amazing! He’s quite a charming frog under his mushroom umbrella. Notice the pretty butterfly among the flowers at the top too! This one is a little different in that it actually appears to be an engraving and not pen flourished. This is a wonderful Royalty Free Frog Image! 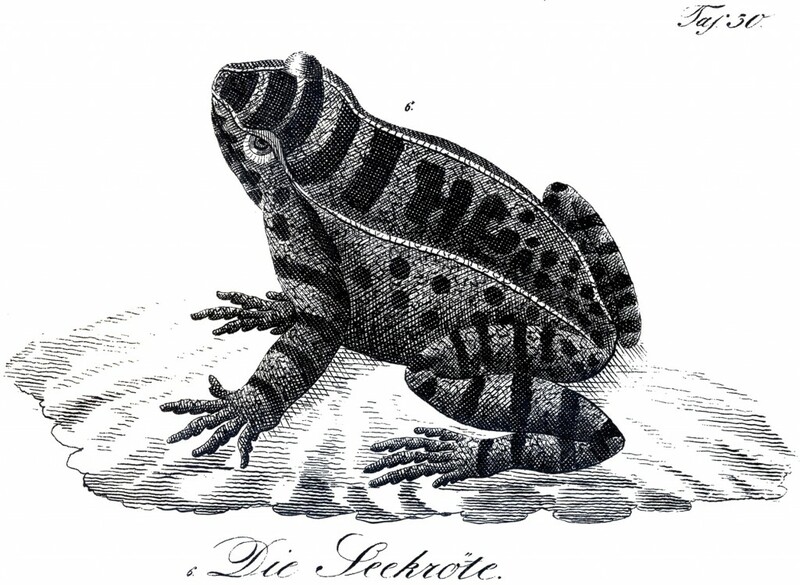 This Vintage Engraving was scanned from a fabulous early Natural History Book about Amphibians, Circa 1838, from Germany! Shown above is a marvelous black and white drawing of a lovely Frog sitting on a Lily Pad. 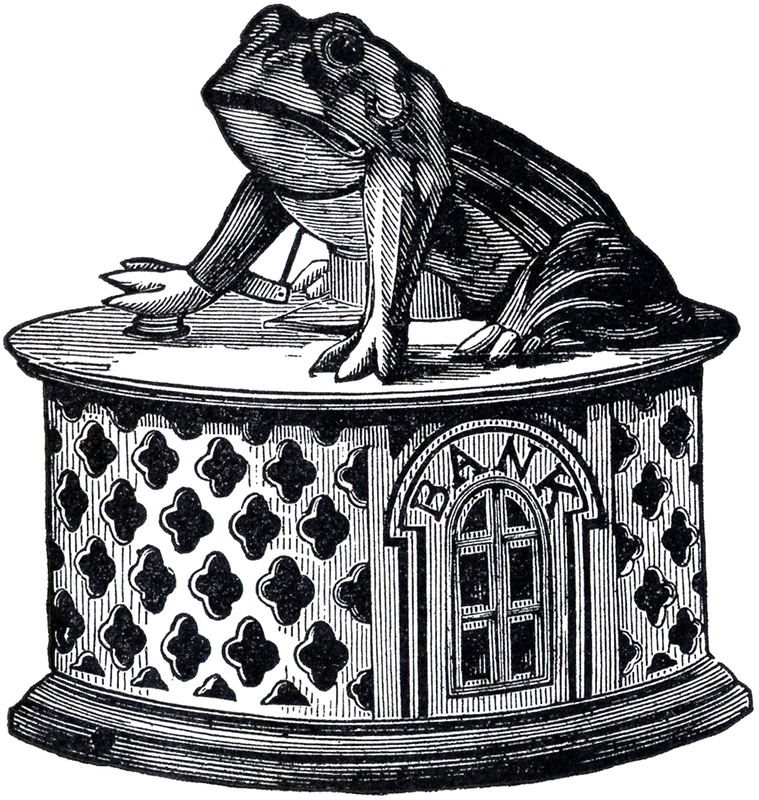 Don’t you just love this wonderful Cast Iron Frog Bank Image? Shown above is a fantastic Antique Iron Bank with a funny Frog on top! This is such a cool illustration that I wish I had the real thing! This image is scanned from a very rare printer’s book in my collection! There is no date in the book, but my best guess would be that it’s from around the 1880′s. This black and white line drawing of a Frog is quite charming. He has very large eyes and seems to be smiling. Perhaps he is focused on an insect. This cute little guy comes from a Garden book. This is such a fun Graphic! 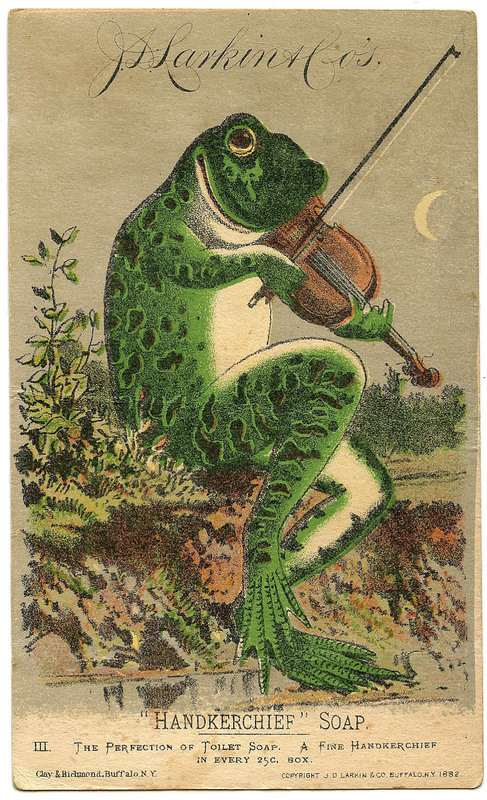 Shown above is an old Larkin Advertising Card that features a fabulous Frog Playing Violin! He also appears to be smiling. What an imaginative idea, and so whimsical! I hope you enjoyed this fun curated collection of 9 Frog Images!!! You might also like our 40 Best Free Bird Images HERE. 16 Horse Clip Art Images! 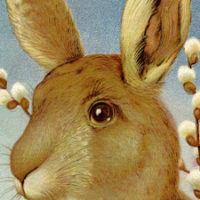 21 Easter Bunny Images Free – Updated! 12+ Deer and Antlers Clipart! Okay, so I just left a comment, Karen, but I have to say this is probably my favorite graphic! I might even make this into a business/calling card for myself. Thanks again for your beautiful images! Thank you for all you do, Karen! He is a very unusual frog. Oh, I love him! Thanks, Karen! I love the vintage frog pics and he is so cute with the violin. thanks so very much. What a fantastic froggy find! Could I please ask where the right place to leave a request for request thursday would be? Many thanks. I love this froggy! Thanks, Karen! I have a darling teenage granddaughter that loves and collects frogs. This will be perfect to use for something for her for Valentines Day! Thank you, so much! You are soooo nice to take time each day to offer these amazing vintage images! How darling!! A happy frog makes eveyone smile. I as a general rule avoid frogs cuz they are creepy but this one is so cute. That is awesome Tracy, have fun!